Most US housing markets saw a surge in demand for luxury homes during the boom of the housing market, and now some markets are finding that there will be no recovery for the majority of these homes. It is my belief that the explosion in the sale of luxury homes was fueled by a combination of two significant loan programs created by the banking industry, and these two "game changers" will not be offered again in my lifetime (more on that below). Currently, there are several years worth of supply of luxury homes for sale in Tallahassee, and I see no realistic scenario that will allow these homes to appreciate again in the next ten years. This means that patient home buyers who want to buy a luxury home in Tallahassee are going to see some incredible opportunities come their way. First, we had a booming economy that was artificially stoked by HELOCs (home equity lines of credit). With home values soaring from 2000 to 2007, many regional lenders offered credit lines on homes for 100% of the homes value (and even more in some cases). Lenders were so confident in the continuation of rising real estate values that they were willing to lend everything they had, secured only with the hope of future collateral. The money that families borrowed fueled the economy. Our "HELOC Economy" had consumer confidence soaring, and it only fueled continued growth of the real estate market. Many families used the "equity" from their homes to buy 2nd homes and resort homes. This artificial demand made it seem like we could not build homes fast enough. Secondly, lenders produced low-rate, interest-only adjustable rate loans. These allowed borrowers to purchase twice as much home as they could afford with a traditional loan, and many people chose to do so. I believe the market from 2003 through 2006 produced more buyers for Tallahassee high end homes than any 10 year period will for the next thirty years. No longer are these interest-only ARMs available, and the HELOC economy will not be returning. 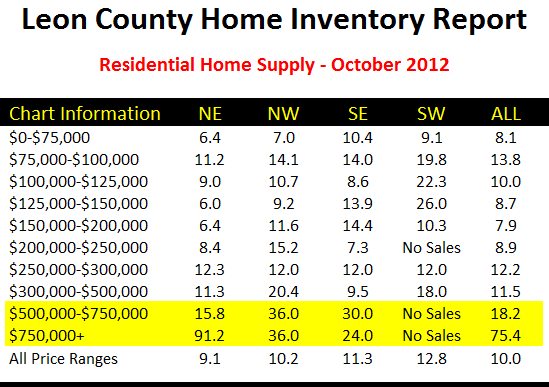 Thus we are in a period where luxury homes in Tallahassee will again be for the super wealthy. So what does that mean to people with luxury homes that need to sell? If you are trying to sell a luxury home in Tallahassee, you had better not take it lightly. Just hiring your favorite tennis partner for the job of selling your house could cost you hundreds of thousands of dollars, as well as loads of grief. According to information from the Tallahassee MLS, there are more than 7 years supply of luxury homes in Northeast Tallahassee. Overall, there are more than 6 years supply of luxury homes in Leon County, and that of course only counts the homes that are currently on the market. Have you ever considered what would happen if interest rates returned to their fifty-year normal rate of 8.7%? That would reduce the buying power of financed home buyers by more than 50%, meaning very few people without significant amounts of cash would be able to buy luxury homes in Tallahassee. Now what are the odds that rates will return to normal before we exhaust the 7+ year supply of luxury homes (plus the supply in the shadow inventory of homes)? I would think pretty good, wouldn't you? If there are not enough buyers for these homes, won't they leak into the market at lower prices? Won't this cause a trickle-down effect (for example, $1M homes become $900K homes, thus $900K homes become $800K homes, thus $800K homes become $700K homes .... etc.)? I believe the answer is a resounding "Yes" and I know that high end homes will continue to decline in value as they become the supply for the price range below them. The market is healing, but there is no near-future demand for the scores of luxury homes that were built during the boom of the market. If you are entering the market to sell or buy at the highest levels, you can do it safely by ensuring your market analysis is sound. If you would like to know more about luxury homes in Tallahassee, just drop me a note and we can schedule a time to help you succeed in this tumultuous market.